We’d love your help. Let us know what’s wrong with this preview of Legenderry by Daryl Gregory. From the pages of Bill Willingham's Legenderry: A Steampunk Adventure... it's Green Hornet and Kato, goggles-deep in an all-out gang war. Against a Neo-Victorian backdrop of clockworks and bowler hats, the classic pulp crusaders take their war against crime -- infiltrating the enemy in their colorful masked guises -- to whole new levels of whimsy and wonder! When Little Lord Homicide makes his claim as heir to the Big City's underworld, the pint-sized child psychopath incites a gang war against the reigning Veiled Lady... and draws our disguised heroes into a web of intrigue and revenge. As urban warriors from every dank alleyway pour into the violent cobblestone streets, a mysterious new player known as the Brass Hornet makes the chaos decidedly personal by offering a king's ransom for the Green Hornet's head! To ask other readers questions about Legenderry, please sign up. This wasn't a bad read, but as I had previously stated in the Legenderry: Vampirella review, I felt like I was missing things since I had never read the Legenderry series before and this series referenced characters and events from that series. 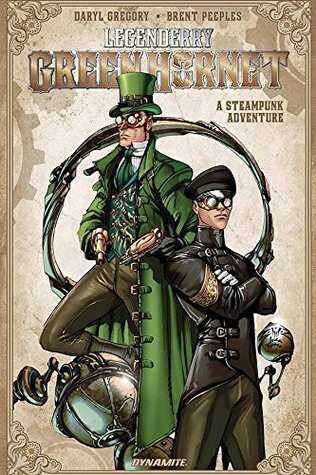 However, the idea of a Steampunk Green Hornet and Kato was just too cool to pass up, and it was an enjoyable read. The art was good as well. Overall not a bad read, but probably more for fans of the original Legenderry series than casual fans. There are plenty of laughs in this story. The main characters are especially funny and the ending is hilarious. Well worth reading and easy to get into because it's barely connected to the main series, let alone to the original characters as far as I can tell. The son of the Murder King has bribed the Velocikings into attacking the Toffs, a gang of thugs that collects taxes from the populace for the current queen of the underworld, the Veiled Lady. She is Lidia Valcallan, the Murder King's ex-wif There are plenty of laughs in this story. The main characters are especially funny and the ending is hilarious. Well worth reading and easy to get into because it's barely connected to the main series, let alone to the original characters as far as I can tell. The son of the Murder King has bribed the Velocikings into attacking the Toffs, a gang of thugs that collects taxes from the populace for the current queen of the underworld, the Veiled Lady. She is Lidia Valcallan, the Murder King's ex-wife and murderess and now. the bride of Blackmass. He was resurrected in the main series and needs ever-more-hard-to-find souls to survive. The boy intends to recover his father's fortune from his step-mother. Green Hornet and Kato will have to face all the gangs in the city to get to the Veiled Lady and stop this mess. OK but not worth spending any money on. Had the germ of an interesting idea for the story. The steampunk was a candy coating that got old fast. I liked the designs for the masks. Glad I could borrow it and check it out. There is another volume that I am not going to bother with. I really liked the Green Hornet in the main Legenderry crossover series, but this solo outing just didn't do it for me. The characters were boring and had no depth whatsoever, although I did like the design of the Brass Hornet character. Award-winning author of Spoonbenders, We Are All Completely Fine, Afterparty, Pandemonium, and others. Some of his short fiction has been collected in Unpossible and Other Stories. He's won the World Fantasy Award, as well as the Shirley Jackson, Crawford, Asimov Readers, and Geffen awards, and his work has been short-listed for many other awards, including the Nebula . His books have been translat Award-winning author of Spoonbenders, We Are All Completely Fine, Afterparty, Pandemonium, and others. Some of his short fiction has been collected in Unpossible and Other Stories. He's won the World Fantasy Award, as well as the Shirley Jackson, Crawford, Asimov Readers, and Geffen awards, and his work has been short-listed for many other awards, including the Nebula . His books have been translated in over a dozen languages, and have been named to best-of-the-year lists from NPR Books, Publishers Weekly, Kirkus, and Library Journal. He is also the writer of Flatline an interactive fiction game from 3 Minute Games, and comics such as Planet of the Apes.